The Power Plant closes in between exhibition seasons for installation, please check our Exhibition dates to confirm the gallery is open to the public! please ask at reception. For more information on accessibility at Harbourfront Centre, please click here. The Power Plant is comprised of four main galleries and a clerestory with a beautiful view of Lake Ontario. The newest addition to the gallery is the redesigned and expanded lobby with improved retail services. Designed for maximum flexibility to showcase the diverse nature of contemporary art, these facilities may also be available for special events and rentals. Learn more. Food, beverages and pets are not permitted in the gallery. Please do not touch the artworks. Photography is permitted unless otherwise indicated. Road work on Lower Simcoe from Harbour Street to Queens Quay has been completed and The Power Plant is now accessible via the new Gardiner Expressway exit ramp at Lower Simcoe Street. From Union Station, board the 509 or 510 streetcar to Harbourfront Centre. For route schedules, visit the TTC website. From Lake Shore Boulevard, take Lower Simcoe Street south to the gallery; from Queens Quay West, turn south at Lower Simcoe Street. Please be sure to take note of any construction updates or road closures. For driving instructions, visit Google Maps. Underground parking is available directly in front of the gallery and above ground at Queens Quay West and Rees Street. For parking rates and locations, visit Harbourfront Centre's website. 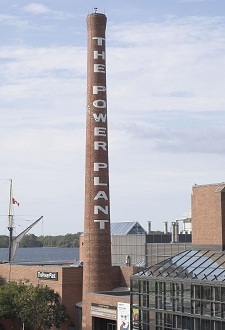 As a leading attraction of Harbourfront Centre, The Power Plant is easily recognized by its smokestack and centrally located within an arts and cultural hub. 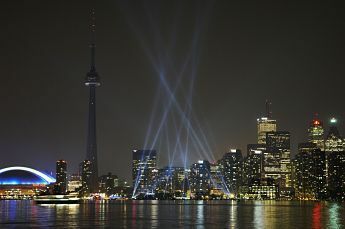 You can experience contemporary art, dance, theatre, performance, restaurants, cafés, and breathtaking views of Toronto’s scenic waterfront, all within walking distance of one another. The Power Plant is conveniently located near the city’s entertainment district and close to the ferry docks to the Toronto Islands, as well as Union Station, The Island Airport, and the Metro Toronto Convention Centre.